How to Talk So Kids Will Listen & Listen So Kids Will Talk is a book I highly recommend to anyone who would like clear, well written advice to promote respectful conversation between parents and children. 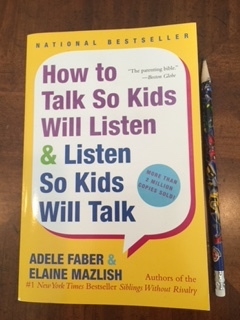 The authors, Adele Faber and Elaine Mazlish, provide instructions for communication between parent and child to help build communication and a more positive parent-child relationship. The skill described is an open ear approach. Techniques are clear for those of us who like to give advice and fix (me!). The authors acknowledge that, although every child is different, they really just want to be heard. It's important to empower our children to make decisions and think things through. By not immediately reacting, and stopping to listen, often a child will make a logical conclusion. If the child needs more information, we can gently guide them in the right direction. Conversation will help build self-confidence crucial to harmony in your family. Note this picture was taken on my kitchen table. And, I have my pencil handy. My study of this book continues. My problem is that I am a fixer. Fixers want to help and tell you what to do. Guess what? This may shock you, but everyone doesn’t want to do what I say. Especially—gasp—not my children. As a gentle reminder to myself, I reference How To Talk So Kids Will Listen & Listen So Kids Will Talk from time to time. Um, even though I have read it twice. My favorite part of the book is the charts sprinkled through the book that say “A Quick Reminder.” These are helpful suggestions that summarize the content of the book. They would be great hanging somewhere in the house as a reminder to have more conversation and “direct” less. Book perk: These communication methods can be used in all areas of life. Read the book, try the advice on any person, any age. And Listen. My littleman doesn’t usually want to do what I say, either lol. Sounds like a very helpful book. I love the idea that it has quick charts for key points. Although the tips are a change of routine, they definitely work. Glad you like charts, too. I enjoyed the illustrations to highlight the key points.